For more than six decades, the International Achievement Award competition has been held annually by the professional association IFAI. At the competition, special achievements in design and innovation in the area of technical textile industry are honored. The IFAI jury consists of product experts, editors, architects and design professionals. In 2015 a total of 293 applications from 11 countries were handed in for the 31 categories of this year’s IAA competition. In the category Corporate Tent Rental with 18 international event projects, the RÖDER Group won the first two places. RÖDER received the highest award, the Award of Excellence, for the project BMW World Promotion. The Düsseldorf-based Hagen Invent agency staged an impressive World Promotion of the new BMW 2 Series Gran Tourer in the Croatian port city Zadar. For this, RÖDER installed a SOLUTION 15 m x 20 m event hall, cladded with a six-meter-high glass-aluminum-facade in the middle of the bay Jazine on swimming pontoons. The 420 international journalists arrived at the impressive location of the press presentation via a 45-meter-long pontoon bridge. In the evening, the colorfully illuminated SOLUTION turns into a spectacular eye-catcher in the port of the seaside resort on the Adriatic Sea. In addition, several RÖDER DICE promotion tents formed numerous attractive lounge areas at several prominent points of the port promenade with information on the new BMW 2 Series Gran Tourer. Providing the international horse riding tournament CHIO in Aachen with a multitude of various tent and hall variations is what made the RÖDER Group receive the sought-after Outstanding Achievement Award. Twenty different tent types set architectural highlights at the CHIO 2014. In large two-story RÖDER tents that formed the VIP hospitality area Champions Circle, about 5,500 celebrities, guests and riders were spoiled with culinary delicacies. Around 200 pagoda tents formed the CHIO village, where more than 150 exhibitors offered their products ranging from riding accessories, to fashion and jewelry, to decoration accessories. The jury honored the design and creative implementation of the RÖDER Group as well as their impressive portfolio of tent and hall systems. 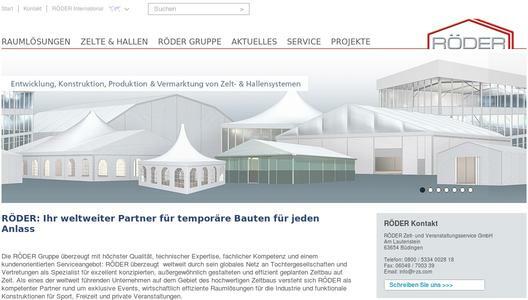 The temporary structures of the RÖDER Group for VIP treatment, sponsor lounges, exhibition and lifestyle areas as well as for prestigious catering are a crucial strategic factor for the success of such big events. At the FEI European Championships in Aachen in August, the tents and halls of the RÖDER Group covered an area of more than 20,000 m². 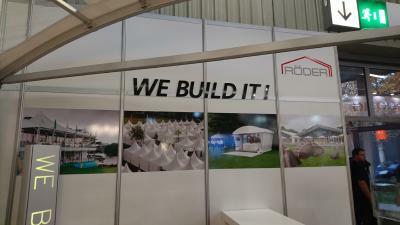 The RÖDER Group is an internationally successful specialist in production, rental and sale of mobile and modular tent and hall systems. With over 560 motivated employees at over 31 locations, the company convinces through quality, know-how and service. RÖDER offers for every requirement in the fields of event, industry, trade fairs, catering and sport the right space solution – worldwide.